Coinciding with A Perfect Chemistry, currently showing at the Scottish National Portrait Gallery, Books from Scotland speaks with Anne M Lyden, author of a new book that accompanies the exhibition. 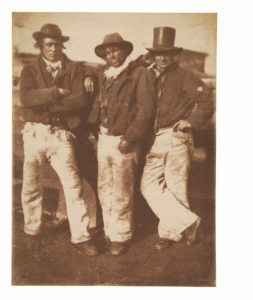 The book and exhibition both highlight the life and work of Edinburgh duo David Octavius Hill and Robert Adamson, who pioneered early photography in the 19th-century. A Perfect Chemistry explores the photography of David Octavius Hill and Robert Adamson. 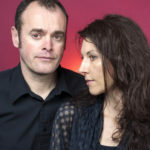 Can you give us a brief introduction to them and their work? 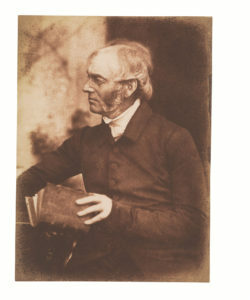 Hill and Adamson were pioneering photographers based in Edinburgh from 1843 to late 1847. This was just four years after photography had been discovered, so they were really right at the dawn of this new medium. Yet they succeeded in mastering it, and have gone down, internationally, in the history books as being very important to photography today. 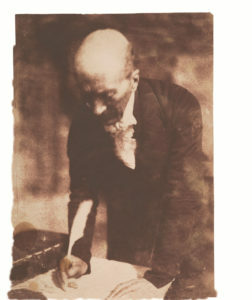 They started off making portraits of ministers who had dramatically walked out of the Church of Scotland to establish the Free Church of Scotland, but then very quickly moved on to other subjects such as the Newhaven fisherfolk, various artists and writers that came to visit or lived in Edinburgh… They also photographed landscapes – a whole range of material. 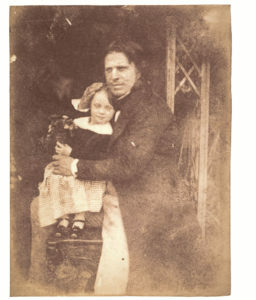 David Octavius Hill and Robert Adamson, David Octavius Hill with his Daughter, Charlotte, probably 1843. Salted paper print, 16.6 × 12.6 cm. National Galleries of Scotland, Edinburgh. Edinburgh Photographic Society Collection, gifted 1987. Can you tell us what makes this book unique? Readers are given a unique opportunity to see the photographs in a contemporary context – both in the sense of contemporary events in Edinburgh in 1843, and contemporary in the sense of how it relates to life for us today in 2017. The parallels are fascinating. The photographs are set out within the context of Hill’s paintings, drawings and sketches and this book is an opportunity to see some of the truest printed reproductions of these early photographs that have ever been published. 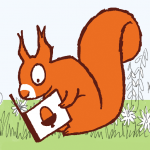 We’ve taken great care to reproduce the images in the book to meticulously match the originals. David Octavius Hill and Robert Adamson, Rev. Dr Patrick Macfarlane (1781–1849), of Greenock; Signatory of the Deed of Demission (23 May 1843), 1843–47. Salted paper print, 19.4 × 13.7 cm. National Galleries of Scotland, Edinburgh. In the book, you describe an event that shook 1840s Scotland much as Brexit is shaking the UK today. What was it about this event that was so monumental, and how did it lead to this incredible photographic partnership? At that time, society was firmly structured around the Church. This event, known as the Disruption, was a dramatic split within the Church of Scotland from which the Free Church of Scotland – a brand new denomination – was formed. It was polarising for the entire country. It was a matter of people standing up for democracy, for values they believed in on either side of the argument, and I think that’s something we can relate to in today’s events. As a painter, Hill wanted to record this moment because he knew it was monumental; he knew history would change as a result of this. Yet the task ahead of him was a challenging one: in trying to portray the 400-or-so ministers in a democratic fashion, which was of course in the spirit of the whole schism. So he was introduced to photography as a way to expedite the process of capturing likenesses of all the people involved. He then portrayed all of those involved in one painting, showing the true likeness of every one of them! 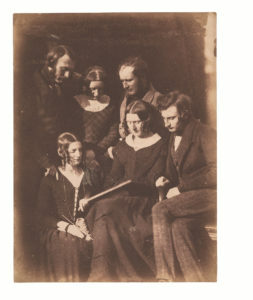 David Octavius Hill and Robert Adamson, The Adamson Family: Dr John Adamson, Mrs Alexander Adamson, Alexander Adamson, Miss Melville Adamson and Robert Adamson, 1843–47. Salted paper print, 20.8 × 15.7 cm. National Galleries of Scotland, Edinburgh. Elliot Collection, bequeathed 1950. What do you think it was about photographing people going about their daily lives that so interested Hill & Adamson? Firstly they were obviously both very artistically inclined. Hill was already an established artist, and was also a very congenial character – he liked people, and people liked his company – and Adamson was part of a large, tight-knit family, so there was a real engagement with people that they both expressed. I think that they had slightly different motivations; Adamson came to set up his own studio in Edinburgh in his early twenties, he left the rural life and came into the capital city to make a go of it, so he had all this ambition. Hill was already an established artist and well known within the community, but he was completely smitten with this new medium of photography and immediately saw the potential for it. So, there’s this catalyst that the two of them provided for one another that I think stems from a real interest in what goes on around them, from an engagement with life and a desire to portray that in a truthful, naturalistic way. There’s an immediacy and spontaneity to it; even though the photographs were staged and posed, there’s still this feeling of veracity – they really did get together to have some beer or listen to some music, or to dress up and illustrate some of Walter Scott’s novels. There’s a real sense of participation, and it’s not really one of passivity: it truly is one of the sitter and the photographer being in tacit agreement with one another. Portraiture is a very hard thing to do; to get a really good portrait of someone they have to give something back to the photographer, and the photographer has to elicit something from the sitter. So that’s another kind of perfect chemistry. Not everyone can do it, but they did. David Octavius Hill and Robert Adamson, Alexander Rutherford, William Ramsay and John Liston, 1843–47. Salted paper print, 18.9 × 14.2 cm. National Galleries of Scotland, Edinburgh. Do you see any parallels between Scotland in the mid-1800s and today? Yes, I think there’s a tendency to see the 1800s as far off in the past, with that stereotype of 1840s stuffy Victorians, but I think what’s so compelling about these photographs is that it really shows us that they were people that are just like you and me today. They had their interests and their passions, and were standing up for things that they believed in, whether that was as a minister breaking away from the existing church, or a chartist politician, or someone who was interested in social welfare for the people of the nation. Those types of people exist in any age, because essentially people are the same. The idea of photographing your friends at a get-together really isn’t novel, it’s something that we can relate to, and even this idea of the selfie – well as we said, Hill was the most featured subject, so he was the original selfie taker! So I think it’s the stuff of life: it’s recognising these auspicious moments and wanting to record them for posterity, but it’s also celebrating and enjoying the small, daily rituals and seeing those as just as much a part of life and creative expression. 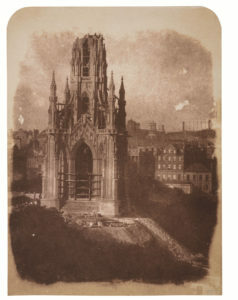 David Octavius Hill and Robert Adamson, The Scott Monument under Construction, 1843. Salted paper print, 20.1 × 14.9 cm. National Galleries of Scotland, Edinburgh. Funnily enough, I first became interested in photography when I was a teenager, and it was through books. Through photography books I felt the excitement that one could get from looking at these beautiful reproductions and learning more about the photographer responsible for making them. I knew I didn’t want to be a photographer – I just wanted to always learn more about those who were photographers and what they were making, and books were the easiest way to get into that. One of the first books that I bought was a photo book by Thomas Joshua Cooper, which I bought from the Third Eye Centre in Glasgow (now the CCA). 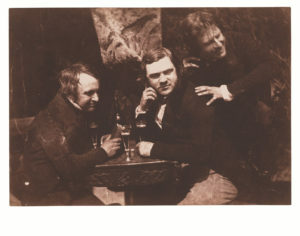 David Octavius Hill and Robert Adamson, Edinburgh Ale: James Ballantine, Dr George Bell and David Octavius Hill, 1843–47. Salted paper print, 13 × 19.4 cm. National Galleries of Scotland, Edinburgh. If you had five minutes with these fascinating men, what question would you ask them? How on earth did you do it?! Given that you had to work outdoors, in Scotland where it’s rainy and windy, just how did you do it on a practical level, and create so many amazing photographs in those challenging conditions? They could have created anything from 15 to 20 negatives in one day, but then you’ve also got the whole printing process, and although that could obviously happen later it’s still so time-consuming and they’d also need to be developed out in the sunshine. So yes, I’d love to ask them just how they managed to create so many photographs in such a short space of time, in such challenging conditions. David Octavius Hill and Robert Adamson, Rev. William Govan (1804–1875), Missionary in South Africa, 1843–47. Salted paper print, 20.3 × 14.8 cm. National Galleries of Scotland, Edinburgh. 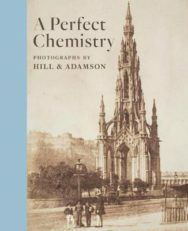 A Perfect Chemistry: Photographs by Hill & Adamson is published by the National Galleries of Scotland. The hardback edition, priced £29.95, is available in all good bookshops. The book accompanies the current Hill and Adamson exhibition on at the Scottish National Portrait Gallery which runs until 1 October. A special edition, limited to just 200 copies and signed by the author, is available exclusively from the National Galleries of Scotland, priced £48.50.